Thursday was Little Man’s last day of 3-yr old preschool and he wanted to make the teachers cards and hearts. 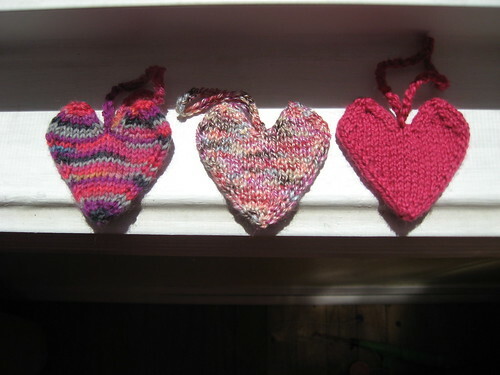 he was in charge of the cards and i was asked if i could knit the hearts. of course i agreed. Boy was i starting to regret after i frogged my first heart 3 times. Hearts, originally uploaded by Craftydiddl. My Thoughts: it’s a great pattern and i love that it’s seamless. But for whatever reason i totally screwed up the first 3 times i cast on-somehow on the 3rd row i totally messed something up-don’t know what but my numbers were off and on my first heart i started to end up with a three sides heart-like i was doing to many repeats. But i finally just figured out what she was aiming for and made the heart with my own numbers and i ended up making them just a tad bigger. I did not stuff them since i was making them to hang and i did a crochet chain for the hangers. great pattern i will make more of these. Hope you all have had a wonderful weekend!! The bag and hearts came out great! Oh it’s so sweet that Little Man wanted hearts for his teachers. They’re so cute too. I bet the teachers were thrilled. your hearts came out wonderful. I am so sorry you had so much trouble the first few times with hte pattern. It looks like multiple people are having the same problem… i think it is due to the Krl stitch. I have tried to clear it up a bit more now. if you have any suggestions on how I can improve the pattern i would love to hear them.